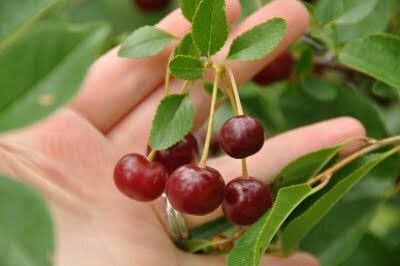 Carmine Jewel and Romeo cherries are extremely hardy dwarf cherry trees (bushes really) that grow just 6-8 feet tall and are hardy to about -45 degrees! 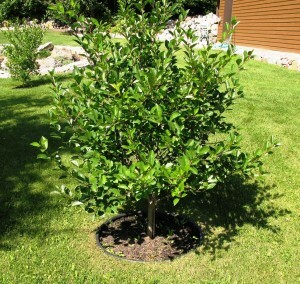 These low maintenance plants usually begin bearing about 3 or 4 years after planting and by the 6th year average about 25 lbs per bush, although upwards of 70 lbs. have been reported in home gardens. Both ‘Carmine Jewel’ and ‘Romeo’ were developed in Saskatchewan, Canada as hybrid crosses between pie cherries (P. cerasus) and dwarf ground cherry (P. fruiticosa). Carmine Jewel was the first to be released in Canada in 1999, but has only recently become available in the U.S. Romeo was released a few years later. ‘Carmine Jewel’ produces an abundance of dark red, almost black fruit, and the dark red pigment goes throughout the fruit, which may indicate high levels of anthocyanins. This could put them in the category of a superfruit in terms of nutritional value, specifically for antioxidants. Pies and jams made from the fruit are considered gourmet by those comparing it to Montmorency pie cherries. It is slightly hardier than ‘Romeo’. Romeo is very similar to Carmine Jewel, but matures later in the season. Romeo is very flavorful and considered the best variety for juice. It is very productive and has slightly larger fruit than Carmine Jewel. Excellent for fresh eating and for juice. Do not harvest the fruit until it turns a dark shade of black-red. The fruit will have half the sugar and twice the acidity when red. Leaving them several more weeks will allow more sugars and flavors to develop.